As part of the 2012–13 NC State Wolfpack men's basketball team, as a freshman Warren averaged 12.1 points a game and 4.2 rebounds in 27 minutes per game earning him the award of being named to the ACC All-Freshmen Team. He also led the ACC in shooting percentage that year at .622, or 62.2%. Warren's best game that season came against Florida State on February 19, 2013, where he scored 31 points and had 13 rebounds. He helped lead the Wolfpack back into the National Collegiate Athletic Association (NCAA) Tournament. As an 8 seed, they lost to Temple University in the second round of the NCAA tournament. The loss ended the team's season with a 24-11 record. Warren decided to stay for his sophomore year despite being rated as one of the top 31 prospects in the NBA draft during his freshman year. His main influence was his father who convinced him that playing another year at NC State would benefit Warren more, by allowing him to further develop his basketball skills and also improve his draft spot for the NBA. His father is Tony Warren Sr., who played for NC State from 1977 to 1979 under Norm Sloan. Warren had career highs in points with 41 against Pittsburgh, followed by a 42-point performance versus Boston College. He led his team to the final 64 in NCAA tournament, with a 12 seed, after beating Xavier in the first four, but ended his sophomore season losing to St. Louis in the second round after scoring 28 points. For the year, Warren averaged 24.9 points and 7.1 rebounds per game while playing an average of 35.4 minutes per game. Warren led his school to a 22-14 record and went 9-9 in the ACC in his sophomore year. He ended up leading the team with 7.1 rebounds per game and 1.8 steals per game. He also is the first player to win ACC Player of the year from the school since Julius Hodge. 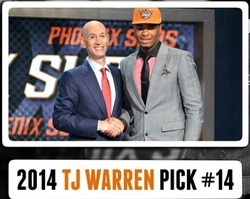 In April 2014, Warren declared for the NBA draft, foregoing his final two year of college eligibility. In 2014, Warren was in the running for the 38th Annual Wooden Award which is awarded to the National Player of the Year for the collegiate basketball season. He was named to the Mid-Season Wooden Watch list where he was one of 25 players seriously considered for the award. This article uses material from the Wikipedia article "T. J. Warren", which is released under the Creative Commons Attribution-Share-Alike License 3.0 Unported License.